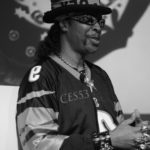 Bootsy Collins is an American musician and singer-songwriter. Rising to prominence with James Brown in the early 1970’s, and later with Parliament-Funkadelic, Collins’s driving bass guitar and humorous vocals established him as one of the leading names in funk. He is a member of the Rock and Roll Hall of Fame, inducted in 1997 with 15 other members of Parliament-Funkadelic. "I try to bring it across on my record, in my dress, in what I do and what I say because to me humor is important. You should have a dose of that and I guess giving it is what I’m here for." "I like being out front, doing what I do, but then I also like playing in a band too. I’d like to do stuff like I did with Deee-lite. I went out and played with them and they were the stars, that was cool."